Savory Kitchen Table: PEACHES - it's that time of year. PEACHES - it's that time of year. August is National Peach Month. Here’s a round-up of facts about one of the world’s favorite fruits. The peach originated in China and has been cultivated at least since 1000 B.C.E. It has special significance in Chinese culture: The peach tree is considered to be the tree of life and peaches are symbols of immortality and unity. Peach blossoms are carried by Chinese brides. Peaches traveled west via the silk roads to Persia, earning them the botanical name Prunus persica. In Persia, peaches were discovered by Alexander the Great, who mentions half a dozen types, and who introduced them to the Greeks. By 322 B.C.E. Greece enjoyed the peach, and by 50 to 20 B.C.E., Romans grew and sold them for the modern equivalent of $4.50. The Romans called the peach a Persian apple, and the name for peach in numerous languages is the name for Persia. * Once the Romans cultivated the fruit, they were able to transport it north and west to other countries of their European empire. *Pêche (French), Pfirsich (German), pesca (Italian), melocotón (Spanish), pêssego (Portuguese), fersken (Danish/Norwegian), persika (Swedish), persikka (Finnish), persik (Russian), brzoskwinia (Polish), breskva (Serbo-Croat), piersica (Romanian), praskova (Bulgarian), robakinon (Greek), seftali (Turkish), afarseq (Hebrew), khúkh (Arabic), hulu (Persian), arú (Hindi), tao (Chinese), momo (Japanese), persik (Indonesian). Spaniards brought peaches to South America and the French introduced them to Louisiana. The English took them to their Jamestown and Massachusetts colonies. Columbus brought peach trees to America on his second and third voyages. To this day China remains the largest world producer of peaches, with Italy second. Italy is the main exporter of peaches in the European Union; the regions of Campania and Emilia Romagna account for more than 50% of Italy’s annual production. California produces more than 50% of the peaches in the United States (and grows 175 different varieties). So many peaches are grown in Georgia that it became known as the Peach State. True wild peaches are only found in China. Unlike the cultivated fruit, the wild fruit is small, sour and very fuzzy. Peach varieties can be either clingstone, where the flesh of the fruit clings to the stone, or freestone, where the stone readily twists away from the fruit. The former type is generally used for canning; the latter is generally found in supermarkets. 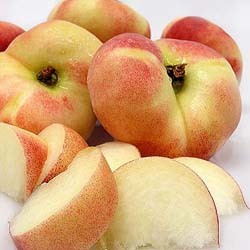 Clingstone and freestone peaches are available in both white and yellow varieties. Giant yellow peaches. Available in season at Melissas.com. Asians generally prefer the sweeter and less acidic white varieties of peach. The sweetness is due to the “honey gene,” a dominant gene that is found in all Chinese peach varieties. Europeans and Americans have typically cultivated the yellow-skin, yellow-flesh varieties, which have higher acid. 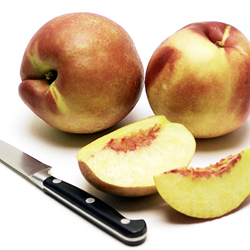 The downy skin of the peach is generally flushed with red coloring, in both yellow and white varieties. The most widely-available peaches are round with a pointed end, but they can also be flat and disc-shaped. The donut peach, which is flat with rounded sides that draw in toward an indented center, like a doughnut without a hole, is a descendant of the flat Chinese peach. A flat-variety “Saturn” peach, so-called because it resembles the rings of Saturn. Available in season (June-August) at Melissas.com. 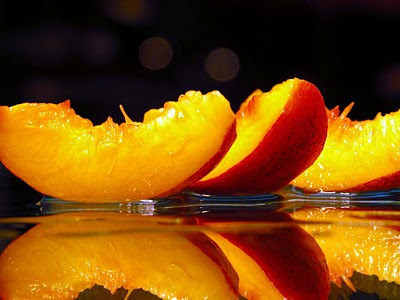 The finest peaches of all are considered to be the pêches de vigne, which are small, red-fleshed fruits grown in vineyards in France and generally found only there. Covered with grayish down, they are not particularly attractive, but the flavor is said to be superb. You can ripen peaches by placing them in a brown paper bag for two to three days. Sliced, fresh peaches should be tossed in lemon or lime juice to prevent browning. Nectarines are a variety of peach with a smooth skin, not a cross between a peach and a plum. At right: Honey Royale Nectarines, available in season from Melissas.com. The juice from peaches makes a wonderful moisturizer, and it can be found in many brands of cosmetics. Like the plum and the apricot, the peach is a member of the rose family (Rosaceae), distinguished by its velvety skin. It is classified as a drupe, a fruit with a hard stone. The Bellini: fresh peach purée and spumante, an Italian sparkling wine; Champagne or other sparkling wine can be used. The drink is said to have originated in the 1930s at Harry’s Bar in Venice, a favorite haunt of Ernest Hemingway, and is named for the 15th-century Venetian painter Giovanni Bellini. The peachy color of the cocktail reminded Cipriani of the color of the garments of St. Francis in a famous Bellini painting; Cipriani named the drink in Bellini’s honor. Peach Melba: poached peaches, vanilla ice cream and raspberry purée. The dessert is named after Nellie Melba, the great Australian operatic soprano. 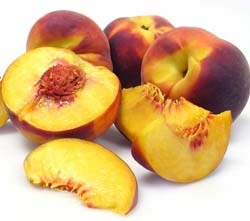 Peaches are a favorite fresh snacking fruit and cereal fruit, and make wonderful pies and jams. Peach ice cream is a summer favorite. Ripe peaches also freeze well for later use.